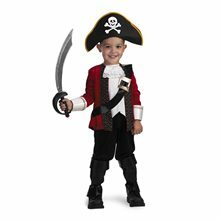 Precious Lil Pirate Toddler Costume.Includes: Dress with peasant shirt, attached red belt, red bandana, boot tops and tights.Available Size: Toddler - Medium (3-4), Toddler - Large (4-6). (See Size Chart For More Information) *Shoes Not Included. Accessories Sold Separately. This little pirate is sure to steal your heart this Halloween. 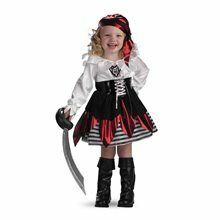 The Precious Lil' Pirate Halloween Costume includes a black dress that features a white peasant style shirt with an attached red belt, a red bandana, a pair of black boot tops and a pair of red and white striped tights. The costume does not include toy sword or shoes. Rockin Skull Pirate Toddler Costume.Includes: Pink and black tutu style dress, head bandanna, glovelets and footless black tights. Available Size: Toddler - Small (24 Months - 2T), Toddler - Large (3T-4T). (See Size Chart For More Information) *Shoes and Accessories Sold Separately. Features a black and pink stripe dress, with black spaghetti straps, black ruffled neckline with black bow accent, and a pink and black ruffled skirt with white tape at the hem. This Halloween Costume includes striped sleevelets, footless tights and pink and black bandana. Please note shoes are not included. 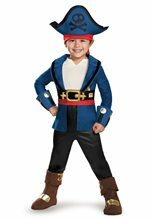 This Pirate Costume is available in Toddler sizes (24 months-2T) and (3T-4T). 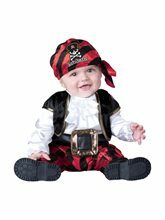 Cap'n Stinker Pirate Boy's Costume Include Baby, Halloween, Pirate, Dress, Diaper, Velcro Closure.